Quentin Bell must have sold or given this still life to Yvonne Kapp (1903-, of whom he wrote, ‘When I fell in love with Yvonne it must have seemed, to adapt a phrase of Jane Austen’s, that I did so to “disoblige my family”. In fact I had no ulterior motive, I just found her voice, her appearance and her mind immensely attractive’. She had been married to the artist Edmund Kapp until she was 27, when she became active politically in London: she supported rights for refugees, workers and women, and was strongly anti-fascist. 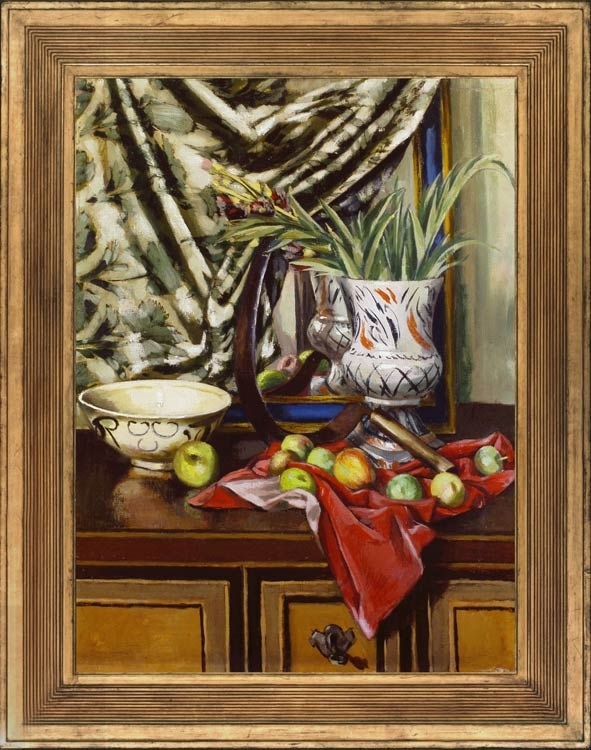 Still life with apples… is composed very much in the manner of similar arrangements by Roger Fry, Vanessa Bell and Duncan Grant, all of whom were very influential for the development of Quentin Bell’s style. The warm, smudgy colouring, the use of decorative cloth, hand-painted pottery, spiky foliage and randomly arranged flowers are characteristic of Bloomsbury still life subjects, as is the composition and brushwork. The flowers – evidently picked from a garden rather than acquired from a florist – the differently-sized apples and the sickle are perhaps all indications that this work was painted in Charleston, where house, garden and art were all intimately connected. Rich and colourful, this painting is also profoundly tranquil. Quentin Bell was a son of Bloomsbury; his father was Clive Bell and his mother Vanessa, sister of Virginia Woolf (née Stephen). He attended the Quaker school, Leighton Park, Reading, and became a writer and art historian. He also painted and made pots; he was involved in the decoration of the church of St Michael and All Angels at Berwick, Sussex, near to Charleston where he lived with his mother, brother Julian, sister Angelica and the latter’s father, Duncan Grant. Quentin Bell taught, and had a diverse career in various universities, including The Slade, University of London; Oxford; Hull; Sussex; and Leeds. He joined Leeds University in 1959 as its first Professor of Fine Art, where he was a great innovator, employing working artists in the department so that practice came together with the teaching of art history. He also led an extensive programme of buying drawings, watercolours, oil paintings and prints for the teaching collection of the University Art Department, including a substantial number of works by the Bloomsbury and Camden Town groups. His painting style, both in technique and composition, is related to that of Vanessa Bell, and is visibly indebted to the Bloomsbury school generally; his versatility in potting, sculpting and mural painting is also a legacy of his upbringing in the midst of the Omega Workshop. Work in public collections includes Still life and Sir Charles Morris (both University of Leeds Art Collection); Bishop Bell (Towner Art Gallery, Eastbourne); Portrait of Leonard Woolf, Still life with bust, and Thorpe le Soken (Charleston, Sussex); The Supper at Emmaus (St Michael & All Angels, Berwick); an earthenware bowl, tile and vase (V&A); and Pots et citron [copy of Pablo Picasso] (Charleston, Sussex).